Congratulations! you are the proud owner of a turkey that has been prepared by Smokey J. That means this Thanksgiving you will be eating the best turkey that you have ever had. In addition you are a good person since all turkey profits are being donated to California Fire Foundation. As you are aware the turkey is brined and cold smoked but still not fully cooked. Lets go over the steps on how to finish this turkey and be hailed by your friends and family as a Thanksgiving genius. The Turkey has arrived in an aluminum roasting pan. This pan is oven ready but is a bit flimsy. If you have a similar sized roasting pan I would recommend using that, if not no worries the pan we provided will work. The turkey has been rubbed down with De Cecco olive oil so no need to oil it. It has been brined so no need to add salt, pepper or any other spice. Step 4: After 3.5 hours its time to take the turkeys temperature. This step is highly recommended, all turkeys and ovens are different so it is impossible to say exactly how long the turkey should cook for. To long and you will have a dry bird, to short a raw bird which is gross. A simple thermometer can be picked up for less than $5 at Safeway, Lucky’s, Walmart, Amazon or any other similar store. The ideal temperature is 145F - 150F. This is a big bird so check the temperature at multiple locations. If even one spot is below 145F continue cooking even if other spots may read above 150F. 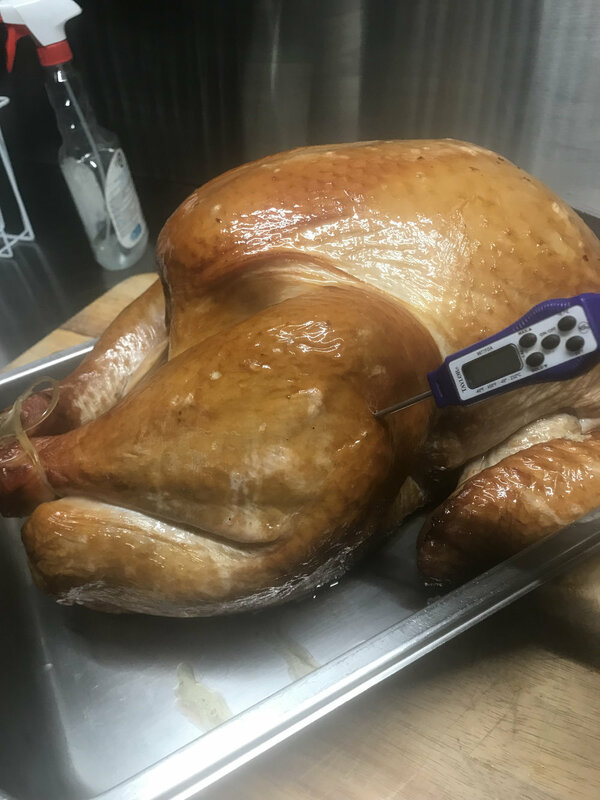 Below is a photo gallery showing where to stick your thermometer. 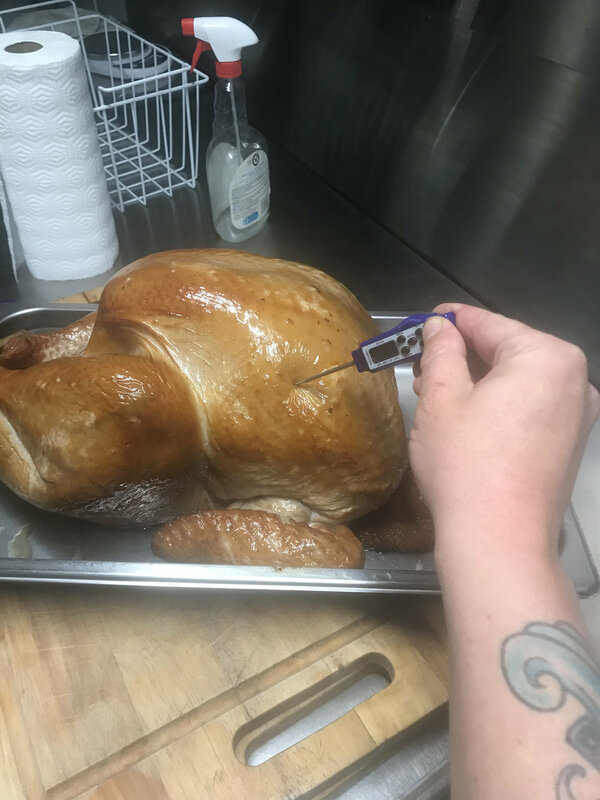 Step 5: The temperature has been reached time to take the bird out of the oven. Be careful its hot and its heavy. Place the turkey on the counter cover with foil and let the turkey rest for 1 hour. If you cut into the meat fresh from the oven all the juices will run out. By allowing the turkey to rest the meat will have time to reabsorb the juice that was cooked out of it.